A good video for use with lessons on global warming, ice melt, and sea level rise. Could be used to prompt students to consider how scientists measure current data, by looking at past events as examples, as well as how scientists continue to monitor data and adjust projections based on new evidence. A good video to pair with another, older one that outlines an earlier prediction for icecap melting rates. This video describes new evidence that scientists are collecting to show that ice sheets may be more vulnerable than previously believed, which has large implications for sea level rise. Comments from expert scientist: The video clearly communicates parallel between Pliocene levels of CO2 and modern levels of CO2, and illustrates both graphically and in map form Pliocene coastlines (example: Florida). 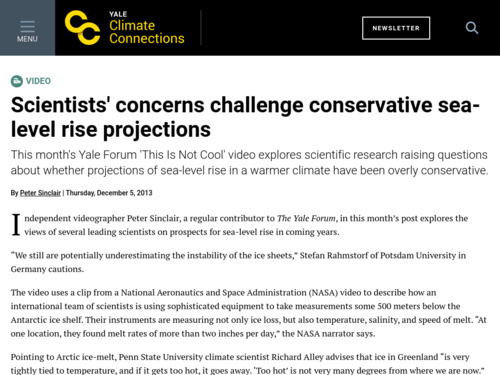 It shows scientists from all over the world, male & female, showing urgency as they talk about their research findings suggesting that major ice sheets are much less stable than previously presumed. Good mix of graphics and expert commentary. Inclusion of ancient scientific data from Pliocene connects ancient climates to modern and demonstrates how Earth has changed over time. Starts off as somewhat alarmist but continues as a useful resource. Comments from expert scientist: The video jumps quickly between ideas and therefore might be better for older students.